Congressional Republicans recently introduced the American Health Care Act, or “TrumpCare,” a potential replacement for the ACA. This bill has the backing of Trump, Ryan, and other Republican leaders. The AHCA includes a proposal to convert Medicaid into a series of block grants as a way to save the government money on health coverage. Block grants are a type of federal funding that allocates a set amount to state governments to run programs like Medicaid. According to the Republicans, block grants will give more freedom to the states and allow more flexibility to be innovative. In theory, devolving more control to the states will allow local governments to more adequately identify which citizens need specific kinds of care. Unfortunately, these promises from the GOP don’t match the reality of what Medicaid block grants mean, especially for the low-income and disabled people who are dependent on Medicaid coverage to stay alive. Trump may praise the AHCA with his usual hyperbolic boasts, but his rhetoric obscures the danger that Medicaid block grants will pose. The most important thing to remember is that Medicaid block grants are actually funding cuts. If the needs of Medicaid recipients in a given state can’t be covered by the money from the federal block grant alone, the state government will have to make up the difference from its own budget. If a state does not have the money to make up this shortfall, it will have to cut its health care budget or other government services. State governments will have to decide which Medicaid recipients are more deserving of care than others, causing some people’s lives to be treated as more valuable than others. If the American Health Care Act is passed, it will mean that people will inevitably go without health coverage or life-saving medications. Removing vital health services will result in more disabled and poor people using emergency rooms as a last-ditch effort to be treated. People with treatable chronic conditions may die because they are no longer able to access the treatment that they had previously been able to access under Medicaid. Emergency room visits as a form of routine health care will ultimately be more costly than regular treatment, but Republican policies ignore this fact and focus on the initial cost instead. Moreover, states already have flexibility in implementing Medicaid under the current system; they can determine eligibility criteria and which services are covered without implementing block grants. Harsh disability cuts have been shown to reduce people’s quality of life in other countries where they have been imposed, like the United Kingdom. British disability cuts have led to worsened health outcomes, poverty, depression, increased crime rates, and suicide. These cuts are cruel, inhumane, and rooted in the misconception that the lives of people with disabilities are intrinsically worth less than the lives of people without disabilities. The policies introduced by Trump, Ryan, and other Republicans arise from similar misconceptions about disability and human worth. When we speak of Medicaid block grants, we should make clear that these grants are cuts that will reduce the quality of or end disabled people’s lives. We should reject the framing of Medicaid block grants as innovative, nimble methods to reduce federal spending and give more control to state governments to provide appropriate care for their citizens. Instead, this funding method will lead to unnecessary deaths and reduced quality of life. 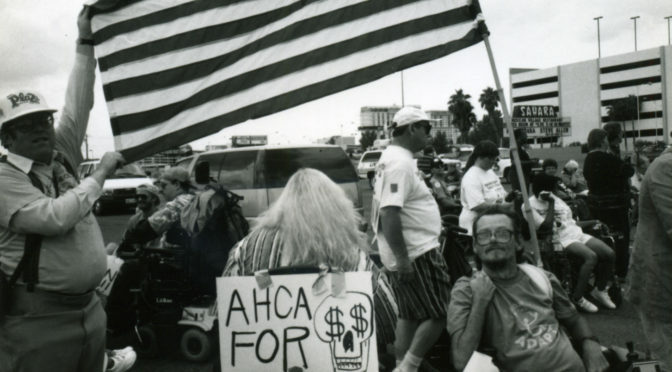 Disability advocates resisting the Trump agenda should include protecting Medicaid from being turned into a block-grant program. People’s lives depend on it. This is not accurate. The AHCA is not proposing Block Grants. per capita caps are no less dangerous. but they are not the same thing. I don’t see how you think it is not the same. The money would be sent to the states depending on how many people qualify in that state. That is where the per capita cap comes from. HOWEVER, after the state receives the money the state can cut benefits to people who are qualified and spend it on other people who are “more deserving” or even not on medical care at all. Don’t states already do this? Determine who gets a certain amount of care and who doesn’t? This article seems a bit of over reach.